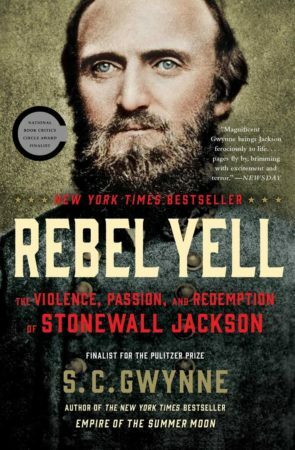 S.C. Gwynne’s book, Rebel Yell: The Violence, Passion, and Redemption of Stonewall Jackson, has already hooked me from the first chapter. The book sets the scene nicely showing that Thomas “Stonewall” Jackson was an obscure and slightly odd professor at Virginia Military Institute (VMI) in Lexington, Virginia. He was not well regarded as a teacher, who “taught the school’s toughest and most loathed course… what we call physics” (Gwynne 15). The description of the then Major Jackson was that of a stiff, rigid man with an unwavering dogmatism for rules and regulations. He possessed deep religious conviction, which must have helped him through “a host of physical ailments” (Gwynne 15). The one area where Jackson commanded respect was in his status as a veteran of the Mexican-American War in 1847. Thus, the first chapter of Gwynne’s biography paints Jackson as an idiosyncratic character, who seemed unlikely to rise to the extraordinary level of fame and prestige that he would one day command as a General in Lee’s Army. I found several aspects of Jackson’s character exceptionally instructive in the first chapter called “Away to Richmond.” First, his tremendous faith was clearly examined as the foundation on which he was initially opposed to the war. Jackson was a Christian, and more specifically a Presbyterian. Due to his faith, he wanted to organize a day of prayer and petition God to prevent the war from happening. He is described as resilient in his faith that he could pray for God to not let the country tear itself apart with war. The author claims that Jackson knew something about war that no one else could see. Amid the joy and enthusiasm for war, Gwynne asserts that Jackson knew the horror of it. He fully grasped the concept of suffering and misery inherent in it. Gwynne concludes that part of “Jackson’s brilliance was that he understood war” (Gwynne 17). Certainly, we can see from his faith that he understood the nature of war. He recognized war as a violent struggle of opposing human wills. The most fascinating part of Jackson is what happened when he was called to war. When he finally resigned to the inevitability that the divine hand of God was not going to intervene, Jackson was all in. By this I mean that he wanted to wage a “total war.” Gwynne goes as far as describing it as a “black flag” war, which meant “no prisoners” (Gwynne 19). This is extremely shocking. It is odd to think that a man can go from despising war because of its horrendous nature to turning a switch in his head as he did. Indeed, he flips the switch, and decides that if war had to happen then it might as well be as bloody and terrible as possible. I re-read that part several times. I find the psychology of Jackson extraordinarily fascinating. Human beings have a capacity for tremendous violence and depravity. However, most people never actually think that they are violent or depraved. Jackson seems to have had a firm grasp on human nature to include his own. It is amazing to think that a man could so badly want peace, yet switch into the mental state of a someone who could accept, condone, and potentially order the most grizzly atrocities of war. Make no mistake about it, the concept of not taking prisoners was radical even for Jackson’s era. But, we shall read further to see how he actually acts as a commander. Jackson’s initial calculation to make the war as bloody and brutal as possible has some rationale to it within the total war principle. One must assume that similar to the way General William Tecumseh Sherman’s famously made the South “howl,” Jackson had his own designs to make the war so atrocious that people would quickly want it to end. That is the theory of Jackson that Gwynne suggests. A much more cynical view might assert that he was mentally deranged. After all, if he knew how bad war was, why wouldn’t he just become a conscientious objector? Why would he fight if he thought it was so disgraceful in the eyes of God? This is where we could get into another interesting side of Jackson’s character by examining the darker implications of his faith. His fatalism, and acceptance of “God’s will.” If Jackson was able to accept that war was the “will of God,” then he was prepared to go to extraordinary lengths to carry out God’s will. This seems to be a certainty if one accepts the premise that his faith guided everything that he said and did. Jackson’s apologists will not appreciate this point of view especially in today’s context when we think of other groups that are willing to carry out atrocities based on their faith. A scary comparison when considering how revered Jackson is in many circles. This darker aspect of war and faith is overlooked with historical hindsight, and the distance of time. The reason I find it instructive is because of how much we can learn about human nature. My own thesis is that religion is not the sole reason people go to war, and it was not Jackson’s reason for war. There was the cause of defending his homeland and the way of life that existed in Virginia. Even though Jackson might not have fought for slavery specifically, there was an obvious social harmony that was maintained through the “peculiar institution.” Jackson himself was a slave owner. Again, when we consider fighting for a specific way of life that is a “peculiar” social order while opposing a foreign power and using religion, particularly the idea of “God’s will,” as an ideological source of inspiration, the comparison to modern conflicts seems too obvious to mention. Thus, we can easily strip away the romanticism of history, and look at Jackson honestly. I’m not going to paint him with anything except through the facts as I see them with information that is currently available. I will freely admit that my point of view is influenced by my own unique moment in history. That’s fine. I have no biases against the man (quite the contrary), but I will not be his apologist either. I am interested in human nature and the serious scholarship of it because I do believe that it transcends time and place. Furthermore, I believe cultures and religions are different manifestations of the human experience and reflections of how societies have evolved over time. At the core of my study rests the notion that human nature and the nature of war remain unchanged.